Random Musings: How'd I Do? First of all, a couple of Christmas picture stragglers. 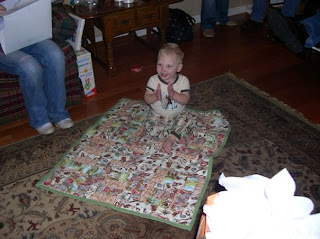 Here's a picture of my great-nephew with the quilt I made for him. Normally I don't post pictures of him here, but just so you can see the size of the blanket better...plus when he opened it, he put it down on the floor, sat down on it and clapped. It was cute. Here's another one I took before I wrapped it. Sorry it's sideways! 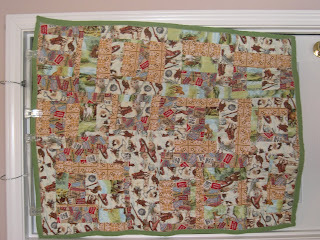 I learned a lot from the process of making it and I got a quilting book for Christmas, so I'm looking forward to making something else soon from all of my scraps. In the meantime, I really need to organize my fabrics. I have a feeling that's going to be my project for the day. But let's talk reading goals, shall we? I had intended to read 100 books in 2008 (I read 93 in 2007). That didn't exactly happen, but that was probably because I took up sewing and it's hard to find time to sew and read! Here's the list of books I read in 2008. Most of them are linked to reviews. I think my goal for 2009 will just be to whittle down the TBR pile I've got going. I have around 90 books sitting on my shelves waiting to be read. As long as that number goes down, I think that will be good. If I can keep the total number of books I read in the 80-90 range, that will be good too. 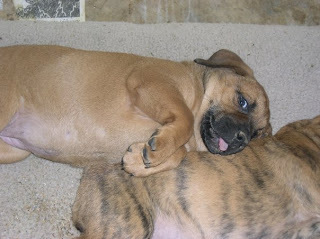 And finally, a couple of puppy pictures. I just learned yesterday that my dad is going to be keeping my favorite puppy, so I'm happy about that. 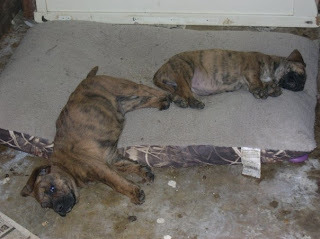 If the other two puppies don't find homes, my dad's neighbor will be taking one and my sister will be taking the other. He said his neighbor took the puppies to the vet a couple of days ago to get their shots and Patches is 13 pounds. The other two are about 11 pounds. And here are Patches and Amber. Patches is the chubby one who is halfway off the bed. I'm concerned... that last one looks like someone chloroformed the puppies! You have it right with the lack of time for reading and sewing!